I have finally started branching out from scarves with my knitting. 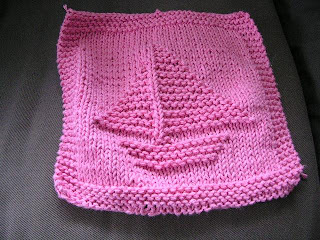 I have several friends who are expecting babies in the next couple of months, and I decided that I would like to knit something for them. After being warned away from baby blankets by Annie, and hearing my mother gripe about how long it is taking to knit the ones she is making for co-workers, I decided that I would start smaller. So, wash cloths it is. They are really easy, which is good for this novice knitter, and pretty quick. And the yarn is 100% cotton and nice to work with, compared to the fun fur and homespun I was using for scarves. I have done two so far - the sailboat above and a lamb, which actually looks kind of like a turtle, but I don't think that is my fault. I intend to do four per person, at this point. If any of you would like to commission me to make some for you to give as gifts, just let me know :) I am sure we could work out some sort of deal. 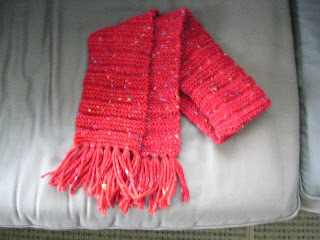 Before starting the wash cloths I did manage to finish Benjamin's Christmas scarf. As you can see, I learned from my mistake of the all stockinette scarf that curled on the sides, and made a sort of pattern. And because I had to buy another ball of yarn to make it long enough, I had plenty of yarn left over to make tassels. I do want to make him a matching hat, but I don't know if I am up to a hat yet. In any case, I won't be doing anything but wash cloths for a little while yet. I really love that yarn - it is Patons Shetland chunky tweed - and so do the cats! They all want to knead it. I may use the leftovers to make a small blankie for them. PS I wasn't gripping! I was sharing! I just found your blog. I grew up in Brockport and many of my relatives are still living there! I was trying to figure out from your pics just where you live. My mom lives over the Park street bride going towards East Ave.
Keep up the good knitting! I knit every day. I bet you could make a hat...it's just a rectangle stitched up the back and gathered on the top.